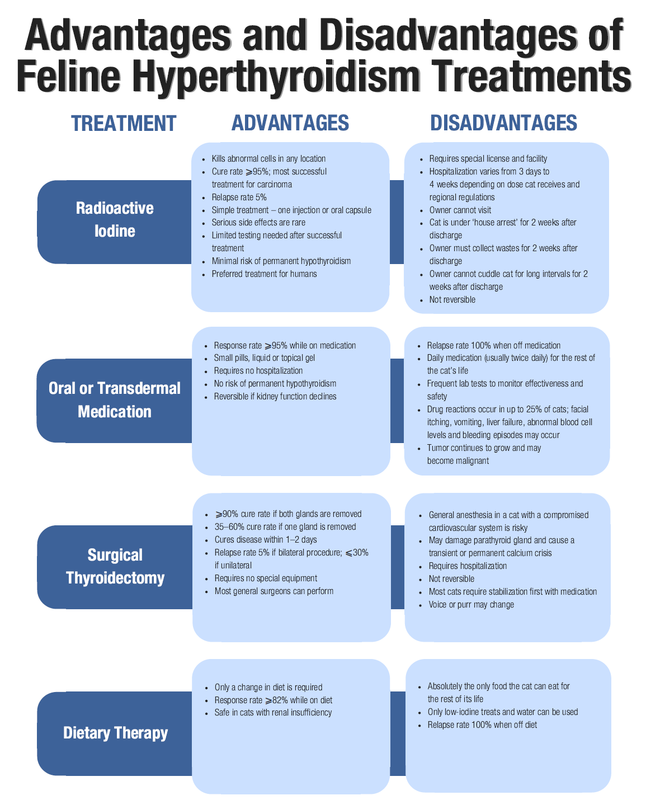 There are pros and cons for all available treatment options for hyperthyroidism in cats, and there is no 'one size fits all' for treating thyroid disease in cats. 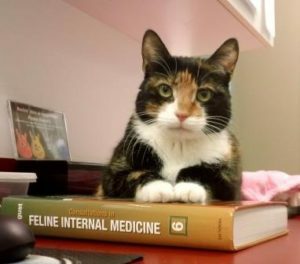 Options other than I 131 may be more suitable for some patients and/or cat owners, though for the majority of cats and cat owners, the advantages of radioiodine treatment far outweigh the advantages of other treatment options, and the disadvantages of radioiodine are few. It is considered the treatment of choice for most patients by veterinary endocrinologists. Except in unusual instances, it eliminates the need for twice daily medication, it cures (rather than controls) the thyroid condition, it requires less frequent monitoring post-treatment, and it eliminates the chance that the typically benign thyroid tumor seen in most cats with hyperthyroidism will transform into a malignant tumor. Radioiodine is successful 97% of the time in effectively curing hyperthyroidism with a single treatment. If hyperthyroidism persists for longer than 3-6 months after treatment, re-treatment with radioiodine is recommended to cure the disorder. Virtually all cats that remain hyperthyroid after the first treatment are cured by the second treatment. Although very uncommon, we do occasionally see patients whose hyperthyroidism recurs months to years after radioiodine treatment. This may be suggestive of a new thyroid tumor causing thyroid levels to rise again (and less likely a re-growth of the first tumor that was treated with radioiodine). A second treatment with radioiodine may be needed.